Bullfighter Flees From Bull! Ole! When you think of courage, there are a lot of different people you could think of. Fire fighters, police, the military… they’re all very brave. They’re also very well protected. Try thinking of brave, but more along the lines of facing down an angry horned animal while protected only by sequins, bright satin, and a flowing red cape. Matadors are usually brave, but as Christian Hernandez proved, when they lose their nerve, the result is controversy. 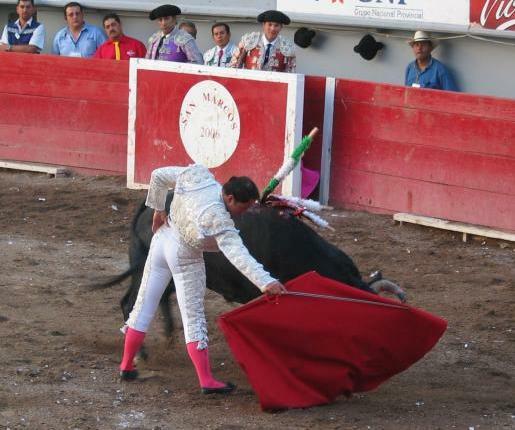 The 22-year-old toreador fled from a bull fight and found himself in legal trouble. After having been gored before, the young Hernandez sought to prove his bravery by stepping back into the bullfighting ring at Plaza Mexico. However, after one pass by the bull, good sense took over and Christian dropped his cape and ran for the safety of the wall. He’s been fined for breach of contract, but it’s a small price to pay for avoiding injury. “There are some things you must be aware of about yourself,” said the Mexican matador. “I didn’t have the ability, I didn’t have the balls, this is not my thing.” Better to find out now, while you still have all your pieces.